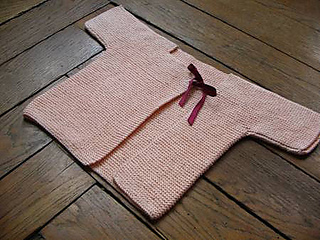 Finished Size: 20 (22, 24)“ (51 56, 61 cm) chest circumference, fastened. 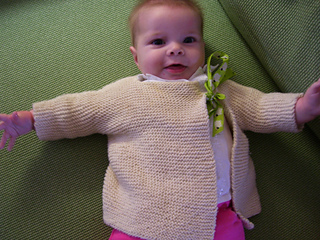 To fit newborn (6 months, 12 months). Yarn: Rowan Wool Cotton (50% merino, 50% cotton; 124 yd 113 m/50 g): #900 antique, 3 (3, 4) balls. yarn distributed by Westminster Fibers. Needles: Size 3 (3.25 mm): 24” (60-cm) circular (cir) and one extra needle for BO. Adjust needle size if necessary to obtain the correct gauge. Notions: Safety pin; stitch holders; tapestry needle; ¾ yarn (¾ m) 3/8” (1-cm) wide ribbon. Note: for tidy and attractive edges, slip the first stitch of all rows knitwise with yarn in back.